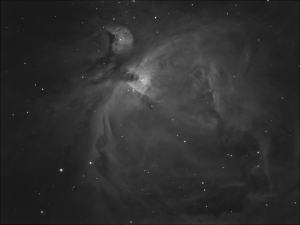 On February 10th, I managed to get some first data on a project in imaging the Orion Nebula with the FLT110/ST2000-XM combo. I had a fair bit of equipment issues here before starting – I have changed scope and was trying a newer PC. I had issues in getting the computer to connect to the ASCOM focuser and so resorted to an old laptop, thus wasting time. Finally (! ), it became apparent when doing the flats that there was frosting on the chip – I’m not sure if this was the case before (though it doesn’t show), but this did mean I needed to run the flats at 2C, rather than -20C like the lights. 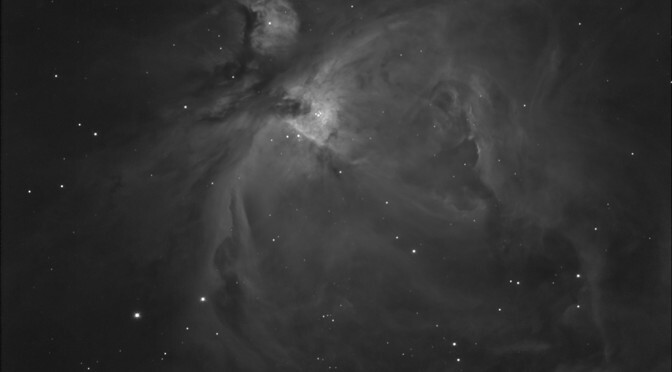 Even so, results are encouraging – this is the result of 27 x 3min with an Astrodon 6nm filter – this is one of the older narrowband range filters – running at -20C at f7. This needs much more data, as well as luminosity and colour channels to allow me to merge it into an L/Ha-Ha/R,G,B image – the fainter regions are fairly noisy, which is not helped by short exposure, and the introduction of noise from the warmer flats, and dark frames for the flats. Processing objects like the Orion nebula is always a little tricky, and I’ve tried to tame the vast dynamic range here by using luminosity masks in Photoshop (with four differently processed versions of the same image) to preserve the detail within the Trapezium, while also allowing me to bring out outer detail. If I can get a good enough night to get more data, I should be able to further blend in more data for the outside regions (possibly by using longer subs). The RGB combine should be interesting, and might need a bit of pushing of the H-Alpha data as it does get a bit diluted in the process.